At the moment I’m working on my Yellow Cab project, this is a series of 6 smaller pieces on wood panels featuring yellow cabs. I’ve finished one so far, four others are in different stages of unfinishedness and one is just an empty panel for now. So the first one I did became a piece that I worked on for quite some time, it stood in my studio and I kept reworking it so it became quite layered, something I really like about the piece. Right now I’m working on the second, third, fourth and fifth piece, I’m doing all of them simultaneously because I want to force myself to take my time and live with them for a while before deciding what to do with them. The dilemma I’m facing now however, concerns my second piece. I put all the gel layers together on the wood panel and now I think it doesn’t need all that much extra. It’s almost right just like it is now. Somehow that makes me feel like a cheat though, because all I did was combining the photographs, there’s almost no paint to be added. Granted, I did take all the photographs so that should count for something. But is it enough? I mean, I feel like the piece should be more of a struggle but that’s just madness, isn’t it? 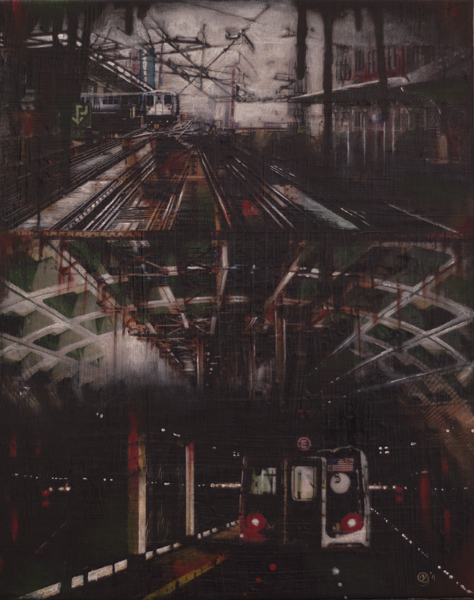 I just finished my Urban Collage project, the finished piece is called ‘Subway’, I decided to rename it after I finished it. This was a fun piece for me, it had been brewing in my head for months and it has finally been set free. 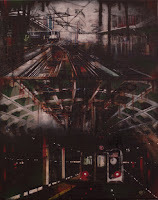 It is a very dark and gritty piece, I like it that way. Some people ask me if I suffer from depression because my work tends to be a bit on the dark side. I’m not though, I’m a very happy and healthy person, my life couldn’t be better! I just happen to love the look and feel of a dark gritty piece of art, it makes me happy! Maybe I’ve finally found my artistic quirk. Happy Monday everyone! It’s the beginning of a new week and I’ve got all kinds of plans. The next part of my Yellow Cab project is currently drying, I only have one empty panel left for this project so I will definitely be working on that. I have the first panel of my Yellow Cab project that is waiting to be finished and I’ve also got my little abstract urban collage that is in the finishing stages. So lots to do this week, I’m looking forward to it! I've had a very busy week this week, but if you ask me what I've been doing I would have to say "nothing much", because it hasn't really been that productive. Well that's not actually true, I hope, I've been doing a lot of work on my website this week, researching and inserting keywords and other meta data. This should yield some results in the virtual world but it doesn't really give me a satisfied feeling. First of all you don't get these results instantaneous, it takes weeks for these changes to take any effect and on top of that it's all virtual, I don't have anything to show for all my hard work and that frustrates me. Creating my actual website was different because that at least gave me something to show, something that wasn't there before. This however gives me nothing, except maybe for some numbers in the future and that's not even guaranteed! Like I said, frustrating! There are many discussions amongst artists about the amount of time one should spend behind the computer for marketing reasons. Many artists will tell you that your time is better spent in your studio with your work and maybe that's true. On the other hand in this day and age I don't think you can afford to ignore the virtual world, especially when you're just starting out. Having an online presence is a way to get your work out there and that's the most important thing when starting your career as an artist, to get your work seen. You can ignore the internet and pretend it's not there but then you would be ignoring the future because I think the digital world is going to become more important every day. This doesn't mean I have to like it though, I'm still frustrated by my lack of studio time and I still don't like not having anything to show for all my hard work this week. That's why I write this blog this week, to give my virtual world frustrations to the internet and say; "see I did do something this week, hah!"